Pen-type readers consist of a light source and photodiode that are placed next to each other in the tip of a pen or wand. To read a bar code, the person holding the pen must move the tip of it across the bars at a relatively uniform speed. The photodiode measures the intensity of the light reflected back from the light source as the tip crosses each bar and space in the printed code. The photodiode generates a waveform that is used to measure the widths of the bars and spaces in the bar code. Dark bars in the bar code absorb light and white spaces reflect light so that the voltage waveform generated by the photodiode is a representation of the bar and space pattern in the bar code. This waveform is decoded by the scanner in a manner similar to the way Morse code dots and dashes are decoded. Laser scanners work the same way as pen type readers except that they use a laser beam as the light source and typically employ either a reciprocating mirror or a rotating prism to scan the laser beam back and forth across the bar code. As with the pen type reader, a photo-diode is used to measure the intensity of the light reflected back from the bar code. In both pen readers and laser scanners, the light emitted by the reader is rapidly varied in brightness with a data pattern and the photo-diode receive circuitry is designed to detect only signals with the same modulated pattern. Two-dimensional imaging scanners are a newer type of bar code reader. They use a camera and image processing techniques to decode the bar code. Video camera readers use small video cameras with the same CCD technology as in a CCD bar code reader except that instead of having a single row of sensors, a video camera has hundreds of rows of sensors arranged in a two dimensional array so that they can generate an image. Large field-of-view readers use high resolution industrial cameras to capture multiple bar codes simultaneously. All the bar codes appearing in the photo are decoded instantly (ImageID patents and code creation tools) or by use of plugins (e.g. the Barcodepedia used a flash application and some web cam for querying a database), have been realized options for resolving the given tasks. Omnidirectional scanning uses "series of straight or curved scanning lines of varying directions in the form of a starburst, a Lissajous pattern, or other multiangle arrangement are projected at the symbol and one or more of them will be able to cross all of the symbol's bars and spaces, no matter what the orientation." Omnidirectional scanners almost all use a laser. Unlike the simpler single-line laser scanners, they produce a pattern of beams in varying orientations allowing them to read barcodes presented to it at different angles. Most of them use a single rotating polygonal mirror and an arrangement of several fixed mirrors to generate their complex scan patterns. Omnidirectional scanners are most familiar through the horizontal scanners in supermarkets, where packages are slid over a glass or sapphire window. There are a range of different omnidirectional units available which can be used for differing scanning applications, ranging from retail type applications with the barcodes read only a few centimetres away from the scanner to industrial conveyor scanning where the unit can be a couple of metres away or more from the code. Omnidirectional scanners are also better at reading poorly printed, wrinkled, or even torn barcodes. While cell phone cameras without auto-focus are not ideal for reading some common barcode formats, there are 2D barcodes which are optimized for cell phones, as well as QR Codes and Data Matrix codes which can be read quickly and accurately with or without auto-focus. Music: CD catalogs – play MP3 when scanned. Groceries, nutrition information, making shopping lists when the last of an item is used, etc. Personal Property inventory (for insurance and other purposes)ode scanned into personal finance software when entering. Later, scanned receipt images can then be automatically associated with the appropriate entries. 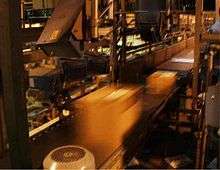 Later, the bar codes can be used to rapidly weed out paper copies not required to be retained for tax or asset inventory purposes. If retailers put barcodes on receipts that allowed downloading an electronic copy or encoded the entire receipt in a 2D barcode, consumers could easily import data into personal finance, property inventory, and grocery management software. Receipts scanned on a scanner could be automatically identified and associated with the appropriate entries in finance and property inventory software. Consumer tracking from the retailer perspective (for example, loyalty card programs that track consumers purchases at the point of sale by having them scan a QR code). Access control (for example, ticket validation at venues), inventory reporting (for example, tracking deliveries), asset tracking (for example, anti-counterfeiting). Smartphones can be used in Google's mobile Android operating system via both their own Google Goggles application. Nokia's Symbian operating system features a barcode scanner which can scan barcodes, while mbarcode is a barcode reader for the Maemo operating system. In the Apple iOS, a barcode reader is not automatically included, but there are more than fifty free or paid apps available with both scanning capabilities and hard-linking to URI. With BlackBerry devices, the App World application can natively scan barcodes. Windows Phone 8 is able to scan barcodes through the Bing search app. 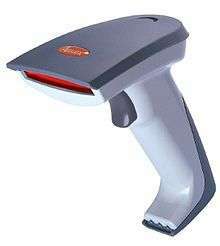 an industrial barcode reader, used to identify products during manufacture or logistics. Often used on conveyor tracks to identify cartons or pallets which need to be routed to another process or shipping location. Another application joins holographic scanners with a checkweigher to read bar codes of any orientation or placement, and weighs the package. Systems like this are used in factory and farm automation for quality management and shipping. a back office equipment to read barcoded documents at high speed (50,000/hour). a cordless barcode scanner is operated by a battery fit inside it and is not connected to the electricity mains and transfer data to the connected device like PC. Early barcode scanners, of all formats, almost universally used the then-common RS-232 serial interface. This was an electrically simple means of connection and the software to access it is also relatively simple, although needing to be written for specific computers and their serial ports. There are a few other less common interfaces. These were used in large EPOS systems with dedicated hardware, rather than attaching to existing commodity computers. In some of these interfaces, the scanning device returned a "raw" signal proportional to the intensities seen while scanning the barcode. This was then decoded by the host device. In some cases the scanning device would convert the symbology of the barcode to one that could be recognized by the host device, such as Code 39. With the popularity of the PC and its standard keyboard interface, it became ever easier to connect physical hardware to a PC and so there was commercial demand similarly to reduce the complexity of the associated software. "Keyboard wedge" (PS/2) hardware plugged between the PC and its normal keyboard, with characters from the barcode scanner appearing exactly as if they had been typed at the keyboard. This made the addition of simple barcode reading abilities to existing programs very easy, without any need to change them, although it did require some care by the user and could be restrictive in the content of the barcodes that could be handled. Later barcode readers began to use USB connectors rather than the keyboard port, as this became a more convenient hardware option. To retain the easy integration with existing programs, a device driver called a "software wedge" could be used, to emulate the keyboard-impersonating behavior of the old "keyboard wedge" hardware. In many cases, a choice of USB interface types (HID, CDC) are provided. Some have PoweredUSB. Some modern handheld barcode readers can be operated in wireless networks according to IEEE 802.11g (WLAN) or IEEE 802.15.1 (Bluetooth). Some barcode readers also support radio frequencies viz. 433 MHz or 910 MHz. Readers without external power sources require their batteries be recharged occasionally, which may make them unsuitable for some uses. The scanner resolution is measured by the size of the dot of light emitted by the reader. If this dot of light is wider than any bar or space in the bar code, then it will overlap two elements (two spaces or two bars) and it may produce wrong output. On the other hand, if a too small dot of light is used, then it can misinterpret any spot on the bar code making the final output wrong. The most commonly used dimension is 13 thou (0.013 in or 0.33 mm), although some scanners can read codes with dimensions as small as 3 thou (0.003 in or 0.075 mm). Most manufacturers advertise bar code resolution in mil, which is interchangeable with thou. Smaller bar codes must be printed at high resolution to be read accurately. ↑ Roger C. Palmer. The Bar Code Book. ↑ Barcode reading apps for enterprise, codeREADr.com, 2010. ↑ "Nokia Europe – Nokia N80 – Support". ↑ "package overview for mbarcode". Maemo.org. Retrieved 28 July 2010. Wikimedia Commons has media related to Barcode scanners.